This species prefers mature deciduous forest, and is often seen making its way head first down a tree trunk, or in gravity-defying maneuvers on the underside of a large branch, exploring the bark for insects and their eggs. It is non-migratory, and will come readily to seed feeders and suet in the winter. It is more abundant in southern Ontario than it is here. The northern boundary of its range occurs within Timiskaming District, though its range may be expanding northwards, perhaps due to milder winters and use of feeders. 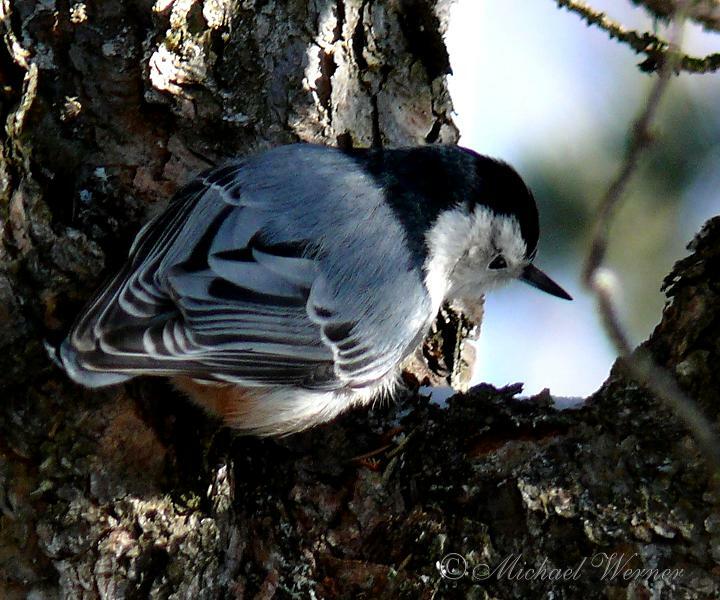 In Timiskaming, it is far less common than its Red-breasted counterpart,. The continental population of White-breasted Nuthatch appears to have more than doubled in the last 40 years, according to a recent analysis of Christmas Bird Count and Breeding Bird Survey records. There is sufficient data about this species to have a very high level of statistical confidence in this magnitude of population growth. October 26, 1997. One observed at Mountain Chutes Camp by Barry Kinch. October - December, 2001. One observed at Mountain Chutes Camp by Barry Kinch. April 16, 2004. One observed at Mountain Chutes Camp by Barry Kinch. October 21-23, 2005. One observed at Mountain Chutes Camp by Barry Kinch.